^In his effort to bridge the great gulf between the book and our own age, Wenham first explains the background of Numbers, discussing its structure, sources, date and authorship as well as its theology and Christian use. A passage-by-passage analysis follows, drawing on social anthropology to offer helpful insights into Old Testament ritual. ^This classic commentary has been completely retypeset and presented in a fresh, vibrant new large paperback format, with new global branding. ^^^The Tyndale Bible Commentaries are designed to help the reader of the Bible understand what the text says and what it means. The Introduction to each book gives a concise but thorough treatment of its authorship, date, original setting and purpose. Following a structural Analysis, the Commentary takes the book section-by-section, drawing out its main themes, and also comments on individual verses and problems of interpretation. Additional Notes provide fuller discussion of particular difficulties. The aim throughout is to explain the true meaning of the Bible and make its message plain. 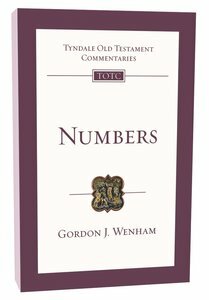 About "Numbers (Re-Formatted) (Tyndale Old Testament Commentary Re-issued/revised Series)"
Gordon J. Wenham (Ph.D., University of Cambridge) is professor of Old Testament studies at the University of Gloucestershire. He is the author or editor of ten books, including major commentaries on Leviticus (New International Commentary on the Old Testament), Genesis 1-11, Genesis 12-50 (2 volumes, Word Biblical Commentary), The Book of Numbers (Tyndale Old Testament Commentary). He is coeditor of the Apollos Old Testament Commentary series in which he is author of the volume on The Book of Psalms.